You probably have an internal network, but if it’s going to be used for voice, a few requirements need to be considered. Voice actually doesn’t require a lot of network bandwidth (we’ve successfully implemented VoIP phones on CAT3 cabling). A telephone call uses less than 100kbps of bandwidth, therefore a typical network connection will provide one thousand times or more bandwidth than the voice requires. What makes voice tricky on an internal network is that it has no tolerance for delayed or lost packets. Since a basic network treats all traffic as equal, a massive data transfer on the network can push the voice traffic into a situation where it’s waiting its turn. This, for users, will appear to be a system fault, as parts of what are being said end up in a buffer, or perhaps even dropped completely. The bottom line is that while voice doesn’t need a lot of bandwidth, it sends and recieves an uninterrupted stream of little packets, and pretty much every single one must be delivered, on time and in order. Another consideration that typically comes up when evaluating a network for voice is how to provide power to the phones. You can buy a little wall plug and see if there’s a spare spot on a power bar (under every single desk in the office! ), or you can deploy Power over Ethernet, which will deliver the power right through the network plug. PoE allows you to power the phones from the network switch, which will usually save you money, through not having to buy dozens of little power supplies and power bars. PoE also allows you to centralize a single source of redundant power for your phones. Connect the PoE switch to your UPS and your phones can stay on when the lights go out. 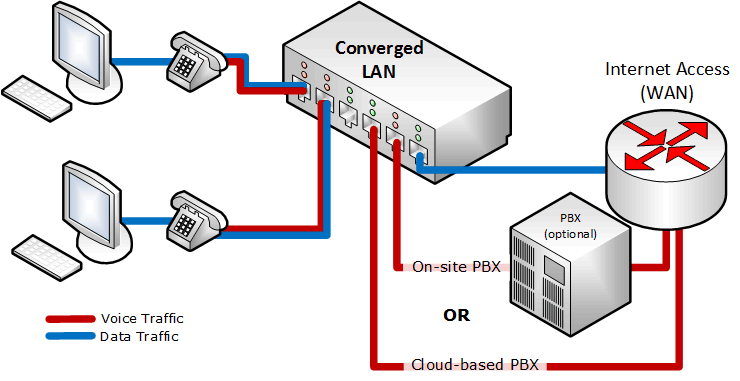 There are several strategies you can follow to address the networking needs of your VoIP project, but I would say the details all boil down to one of two approaches: 1) Build a converged network including QoS and VLANs, or 2) Install a completely separate physical network, dedicated to just the phones with simple, small-business-grade unmanaged PoE switches. In a converged network, all devices on the network are managed as part of a unified, managed whole. Intelligence within the network itself determines how various devices are handled. This method is generally sold as the technically superior way to deploy a network, but it also will tend to cost more to implement and maintain. Larger enterprises will tend to have converged, managed networks. Smaller organizations will tend towards a simpler design. Generally-speaking, you’re going to look to implement a converged network if you have a highly-skilled (and factory-certified) network team, and a budget that allows for the purchase of high-end network hardware. A simpler way to deliver a voice network is to build an entirely separate network to handle the phones. Computer traffic stays off the phone network, and voice traffic never enters the data network. While at first this might seem like an expensive method, the reality is that in many cases it proves to be a far less expensive approach. Another often overlooked advantage of this strategy is that it is usually easier to explain to non-technical administrative staff. In my experience, this factor alone can be the deciding factor in favour of a stand-alone network. 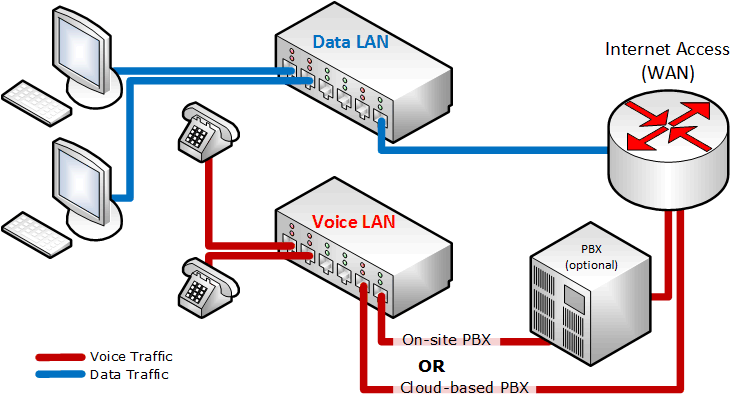 The decision as to what your LAN needs in order to deploy VoIP is dependent on many factors. In general, we have found that smaller companies tend to prefer a dedicated LAN for voice, whereas larger organizations tend towards a converged network.